This Part 2 of L.O.V.E. (Level. Of. Vibratory. Excellence.) builds upon Part 1. PLEASE do not read this until you have read and pondered Part 1. The ways of science, the ways of religion and philosophy, the ways of all experience available and acted upon by humanity… will finally lead each and every one of us to not only know, but, having experienced, UNDERSTAND, “Who We Are.” That wisdom will bring forth the sociality longed for and promised, the GRACE which completes the TRUTH of each and every individual as she realizes that she is no more than yet no less than any other “other.” Yet, focusing and experimenting upon the tangible and observable “things,” most mortals put the cart before the horse, establishing value upon the transient and lower levels of existence. Yet even those most mired in the material will, at some point, “get it.” LOVE is who we are; all 15 billion flavors of “Us.” Yes, each will soon know that the cohesive power of the entire universe is an intangible element called LOVE, and that all things are composed, fundamentally, of energy, which is light. And light is Spirit. Celestial Superglue. Since the intangible things we hold to so desperately are only shadows that will not last, or vibrations, as science classifies them, let us take another step. In the current stage of (mere) existence (vs LIFE), that which we call the “human race”… we live by symbols. We use either written symbols or sound symbols to express every thought or feeling, or to identify every person, place or object. Words are only symbols. Names are only symbols. Our alphabet is only a host of small symbols that can be organized into words… then words into sentences… sentences into thoughts… and thoughts into bits of knowledge that can then connect and augment or confuse OTHER bits of knowledge. Yet, symbols only represent the things for which they stand, not the reality itself. Money is considered the most important factor in life by many because it represents power and security. Of itself, money has no value whatsoever, though through it, it is possible to purchase the comforts and luxuries of earth. Some have forgotten the true meaning behind the symbol, the blessing of plenty as a gift of God, and they worship the symbol instead. Thus, the idol has become the god as it receives the tribute of adulation. Often, regardless of the value of the character holding the money, or the number of material wealth that that individual represents, he is extolled and catered to (worshipped) by the ignorant, unthinking, envying masses as they swagger through life holding aloft his symbol of self-importance and vulgar ostentation. To the degree that one’s focus and choices are upon the material plane, or that which can be perceived by the five physical senses, one is UNconscious, or asleep. As one receives more and more light and understanding (spirit and consciousness), that one “wakes up” and moves from the “human race” of mere existence into ALIVENESS. Being alive is being aware and interacting from a level intended for those who have crossed the finish line, having left the struggle and stress of mortality and its symbolic level of appearances and has entered into “a whole new world.” Eventually, the last man will cross this imaginary (but very real) line, will be awakened again/ “baptized by spirit”/ or “born again” (whether he realizes the occasion or not) and together, we will once again become An (singular and complete) Advanced Family. Although cement can be poured into any shape desired and stone can be chiseled, man has to be formed slowly, thought by thought, word by word, act by act. Thus, man himself is the BOOK OF LIFE, for within him is engraved the complete record of all his thinking and his doings. He is the record and he is also the recorder. Vibration is the eternal, actual substance of life. Those who have created continual vibrations of evil and discord by their thinking and speaking habits will soon no longer be able to “hide” those thoughts, feelings, or actions. Inevitably, they will each reveal in perfect light, what each of those chosen thoughts, feelings or actions have created. He will have BECOME that which he has sent out. Yes, we are no more or less than the thoughts we hold and the vibrations we send out into the universe. That which we offer (or project upon) another, is the very material that returns back to the edifice of our Self that we are (unwittingly) creating. At that time, it will be clearly manifest to all that the smallest loving child with its heart filled with trust, will be far more important than the greatest scholar, scientist, artist, inventor or ruler who greedily clutches to himself personal glory at the sacrifice of others. Those who are selfish or unkind, miserly distributing only vibrations of discord while calculating and comparing the relative pennies he offers to others, will be sorely ashamed… and embarrassed. He will have nowhere to hide and will wish for the rocks to fall and cover him up. 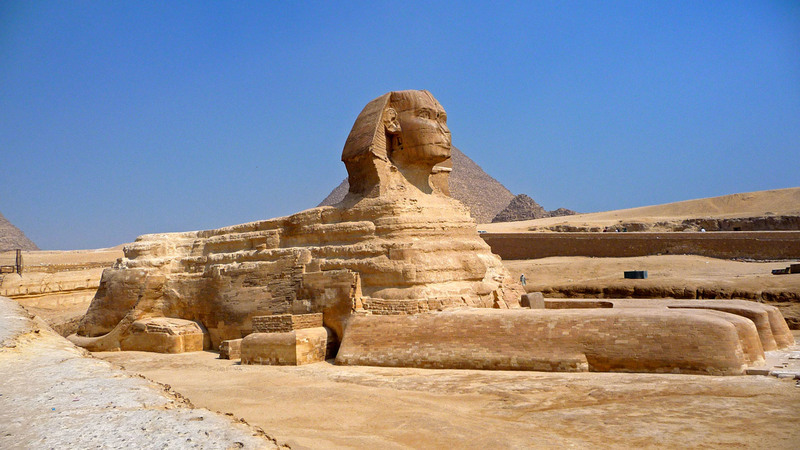 Yet, the sphinx of Egypt is an ancient symbol that has stood since the early ages of the world’s history, signifying that the intelligence of man CAN rule over his animal instincts and passions. Crowned with the ancient headdress of divinity, and having overcome the race, the beast (lion) now reigns over his life with Intelligent LOVE and has taken his part as an “Advanced (Hu)man” among other Advanced Humans. “Hu” signifies “God” or a Being of exalted and pure, excellent vibration. He has finished the mortal race, and has survived and surmounted all things. No earthly symbol can possibly hold more meaning than that eternal message, rising above the sands of time as a witness of the power (and opportunity) within man. Although so misunderstood, there has been one recorded biography that has exemplified this sphinx, or the complete overcoming. That is the story of “Jesus.” Although one must sincerely search, it IS possible to find “the way” of overcoming from that which has been written concerning his life. Of profound significance is the description: “full of grace and truth.” Whatever one’s take upon the one known as “Jesus,” this phrase has the power to enlighten Your path! Having passed through his mortal “pop quizzes” and “temptations” offered by others, the one known as Jesus had cleansed himself of all that was not completely and purely in harmony with his eternal self. As such, he had attained the TRUTH, or rather, the REAL TRUTH, of Who He Was. Yet, as high an achievement as that represents, living in integrity as one’s Real True Self is not sufficient! One must venture BEYOND one’s “real truth” and become “full of GRACE” as well. Picture a ballerina or a gymnast. Having been trained properly and well, an accomplished dancer makes each movement seem fluid and joined into one continual, GRACEFUL sequence. Being FILLED with truth and grace means that all interactions with others is executed likewise: grace-full-y; forgivingly, honoringly of another’s attempts. Yesterday’s post’s inclusion of the “Round Dance of the Cross” was Jesus’ disclosure to his disciples, and mine to you now, of the rest (and most important) of the formula! THIS, “pure religion” is love in action. This is a condition of grace and truth. This is who we each are as part of the pre-requisite to establishing an advanced society of equally awake and alive Human Beings. This is our destiny, our hope, our focus. Yesterday’s descent into “grief” for me was temporary. I KNOW how to bring myself back to my “center,” and I did. It is this state of stillness, this vibrational “hum” that is the “hub” of my life experience, my “Round Dance of the Cross,” that is most comfortable for me. Yet, grace allowed me to experience trauma and difficult experiences. My review of them in my journals yesterday brought them back into the fore-front of my mind. Those experiences were each helpful in my own quest for Self-Discovery. My personal experiences also assist me to assist YOU in your own journey.